Home / Tree of Life / What is the Tree of Life? The Tree of Life is an ancient body of wisdom that has been handed down the generations from teacher to student for thousands of years. Many know it my the name of Kabbalah, the mystical teachings underlying Judaism and Christianity. This practical wisdom teaches us self-mastery on many different levels. The Tree of Life is a sacred map of the inner landscape to guide us through the necessary developments and transformations so that we can reconnect with the source of all life. 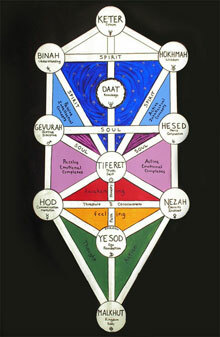 The main teaching diagram in Kabbalah is called the Tree of Life. 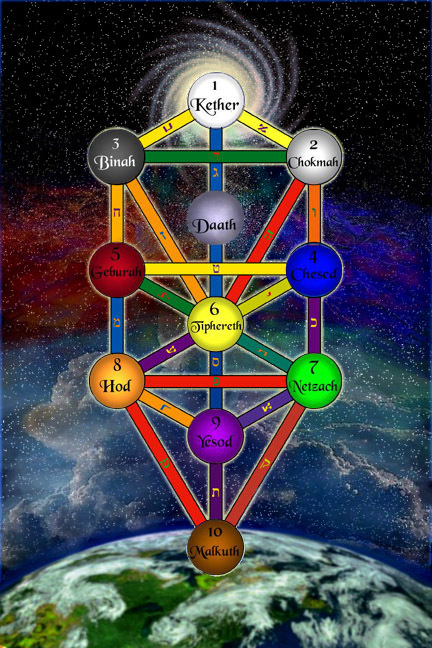 It consists of 11 archetypal qualities called “Sephirot”. These archetypal qualities originate from the Divine Being and are echoed in human nature because we are created in the image of God. Starting from the base of the Tree, Malkhut represents the body and our anchor point to the earth. Here we consciously connect with nature and feel grounded and embodied in the present. Yesod represents the ego, the foundation of the psyche concerned with safety, comfort and survival needs. Yesod knows exactly what you want and need to feel secure in life. Hod is your communication system, your ability to receive information, process, analyze and make the appropriate connections. It facilitates your intuition. Nezah represents your instinctive, “gut” responses to life; attractions and repulsions that naturally draw you to or away from people and situations. Tiferet is the captain of the psyche’s ship, your true Self that can harmonize and integrate the personality into a working whole. Tiferet is your radiant, shining core Self concerned with your individual truth and self-expression. Gevurah is the justice and discipline carried out by the Warrior within you. This is the energy you use to set boundaries and protect your truth. Gevurah focuses your energies and harnesses your will. Hesed is your ability to love and show mercy and compassion. Hesed is an active, powerful force leading you to your passion and heart’s true desire. Daat means knowledge, direct experience that brings a profound sense of knowing without a doubt. Daat enables you to transform your heart and renew your mind. Binah is Divine understanding, the ability to see the universal laws at work in the world and in your own life. Binah understands the workings of fate and how all events are woven together in a vast cosmic plan. Hokhmah is Divine wisdom, the flash of revelation, inspiration and divine insight that can radically change your world in an instant. Hokhmah is your expansive, creative energy, always thinking of new possibilities and new horizons. Keter means crown and is your connection to the Divine, the source of all life. Keter dissolves all boundaries that are keeping you from the Divine and enables you to experience profound healing and inner peace. The Tree is based on 3 vertical pillars that are in a constant interactive dance: the left pillar of form, the right pillar of force and the central pillar of consciousness. Alternatively they are called the pillars of structure, expansion and equilibrium. As the soul ignites into an awakened state, developing and transforming, it dances back and forth between the left and right hand pillars, experiencing sorrow and joy, depression and ecstasy, constriction and expansion, reflection and action, rest and play. The goal of the transformation process is to continually touch base with the central pillar of consciousness, processing and making sense of your life experiences. When stable and permanent contact is made, the central pillar integrates all your diverse experiences, emotions, revelations and dreams into a meaningful whole. With this powerful harmonizing and equalizing focus, the soul can develop, flourish and find its purpose in life.